For information about www.wpradio.co.uk and www.parliamentaryradio.com please go to our WP Radio Page. I have worked in the media, print, radio and television for 40 years and now specialise in web broadcasting. I have been at the forefront of digital reporting through the web and have won the respect of others for my high production values and speaking up for and pushing forward public-interest journalism, so much of which is now under threat. In October 2015 my www.parliamentaryradio.com team won an Honourable Mention in the IAWRT (International Association of Women in Radio and TV) awards. We were the only UK winner. My first book on women MPs was nominated for the Orwell Prize in journalism. I continue to report on business, economics, technology and public policy both nationally and locally. I write blog posts and conduct interviews for podcasts with senior academics, politicians and public policy makers. This work is a seamless continuum from my early days as a journalist on the East Anglian Daily Times in Ipswich where I started my career. In fact I have never changed course I have just over 40 years done more of the same in print, radio and TV and now through the web and as the technology, formats and rules of engagement have changed I have changed with them. I love reporting and if I can teach any of the lessons I have learnt on the way to others then I feel it is my privilege. I just hope I am not too harsh a critic. A skill is a wonderful thing to have and although social media now means everybody can be a blogger, twitter user or author I stand by the training I received "sitting next to Nelly" and learning from colleagues, and the others who surround me how to write, edit, converse and accurately report on work. It is such fun. Thanks to all the teams I continue to work with in 2019. Our fourth book on women MPs charting our 70 plus interviews in #Vote100 year was published in February 2019: "When There's a Woman in the Room #Vote100 Year 2018 to January 2019". These include all our #Vote100 documentaries. It will soon be in all the major national libraries of the UK. 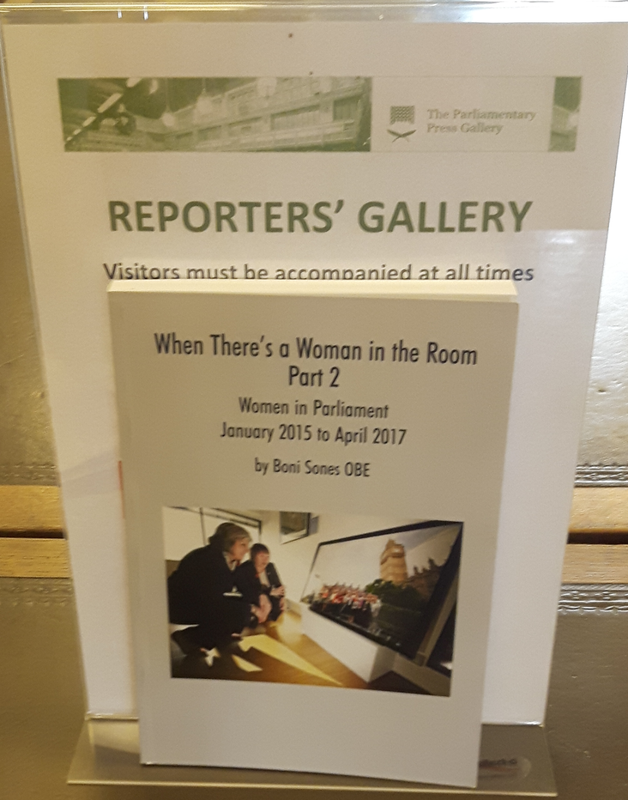 My third book on the work of women MPs in Westminster "When There's a Woman in the Room: Part 2 - Women in Parliament January 2015 to May 2017" (Revised & republished February 2018) can now be found in all the major libraries across the UK including: the British Library, Bodleian Library Oxford University, The Cambridge University Library, National Library of Scotland, National Library of Wales and Trinity College Dublin. I am not trying to be a book seller but I am creating a very important record for historians. Working with the Curator's Office in the House of Commons, Melanie Unwin Co-Director of #Vote100 said: "Thank you and well done, it's a nice recording (another of many!)." 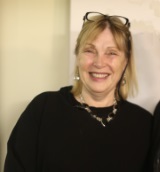 Dr Lisa Cameron, SNP, a member of the www.parliamentaryradio.com board said this of our Vote1000 documentary in February 2018: "Thank you so much Boni, your work is wonderful! " "Your ability to ask interesting and engaging questions in a knowledgeable and energetic way is critical to the success of the podcasts,!" Professor Michael Barrett, JBS, University of Cambridge. Podcasting continues and is becoming ever more popular. It is always a privilege to meet new people, to prepare the ground for interviews and to offer sound broadcast tips and advice to others wanting to do the interviews and then to record those interviews. Not everyone takes to it but with a bit of hand holding, a few choice questions and an interesting guest with a curious presenter, we always make interesting and worthwhile content that can be played through websites or on Soundcloud and tweeted out. It's a joy to work with teams of people who know their field and want to make top of the range podcasts to high broadcast production values. Those values do matter. In May 2017 I will be publishing my third book on women MPs - "When There's a Woman in the Room - Part Two". The publication is timely as it will be 20 years since those 101 Labour Women were elected as part of the Labour landslide of May 1997. All the 115 audio interviews quoted in this book with MPs from all parties will now be held in a special archive, at the History of Parliament Trust thanks to Dr Paul Seward its Director. It is the third book I have written on the work of women MPs in ten years and the third national archive the www.parliamentaryradio.com team of journalists and advisory MPs have established. The others are at the BL and LSE. I look forward to the New Year and continuing the web audio podcasting work with the handful of media teams I have worked with regularly over the past ten years. To think web podcasting has now come of age and that the work we have all done together broadcasting and scripting films is now mainstream. We have already made the front pages in January 2017 with this podcast and blog from the Centre for Business Research, University of Cambridge team (http://www.blogs.jbs.cam.ac.uk/cbr/cbr-economic-forecast-2017-2/). The www.parliamentaryradio.com work is rewarding and now on Soundcloud (https://soundcloud.com/bonisones2) allowing me to tweet our interviews with women MPs across party to others. I thank all parties for their support of our small team, our two books on the work of women MPs and our IAWRT International award, http://www.iawrt.org/iawrt-2015-international-awards-0 (the only UK winner). In March 2017 we celebrate ten years of web broadcasting. I never stop learning and being curious about the work of others. The technology doesn't deliver, the people and teams do. I look forward to a busy January and Spring term in 2017. A Post BREXIT Britain is on the minds of some of my clients. The public policy issues we are discussing include, workers' rights; contractual obligations in the BRICS; how switching to services is helping manufacturers to branch out and grow their businesses; the growth of the Indian economy; a new department at the University of Cambridge to study the impact of language learning; and how the Centre for Public Impact is working across the World to change lives with a new legitimacy, policy and action model of management. Thanks to Simon Deakin at the CBR; Andy Neely and Angela at the CSA; David Roth, Tuhin and Igor at WPP The-Store; Wendy Ayres-Bennett at the MEITS (Multilingualism: Empowering Individuals, Transforming Societies); and Matthew and Nadine at CPI at the BCG. Web journalism is going from strength to strength and video and audio podcasts are an accepted way of getting complex issues communicated effectively. With these long standing friends and associates around me my work is worthwhile, fulfilling, incredibly interesting, creative and fun. I thank them for their confidence in me and for regularly putting work my way. I am growing with them. As ever thanks to Adrian for his web management of my work. He is more than a web manager he is a friend! This month I will be publishing a book about my Through the Looking Glass documentary of 70 interviews across party on the 2015 General Election in Cambridge. Thanks to Dr Paul Seward of the History of Parliament Trust, and the staff of Cambridge City Council for their belief in this work and Alison Litherland for editing it. You can listen to the interviews and read more about it. Democracy is worth preserving. The award winning www.parliamentaryradio.com team will be discussing the latest issues in politics for women in the year ahead going behind the scenes to get beyond the rhetoric of political discussion. Good luck to Dr Lynn Morgan and her team and for the new Arthur Rank Cambridge Hospice opening soon. I enjoyed our training session and meeting you all. A super achievement benefitting your patients. Thanks to Henning Meyer at the Social Europe website for the most interesting commission of converting words to oral story telling. I enjoyed it. 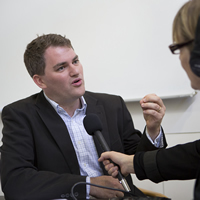 More Centre for Business Research podcast blogs, and hitting the nationals too. More Cambridge Service Alliance website podcasts. More WPP films and events – really progressive work. Scripting the India film was fun. More PGDE University of Cambridge, video podcast information sessions. More www.parliamentaryradio.com podcasts and celebrations of women and the vote – and a New Dawn art installation over St Stephen's entrance. Our documentaries are now deposited with the History of Parliament Trust. I look forward to chairing the Judge Business School panel with Darrin, Shaun and Anna soon. Congratulations to all the teams I work with, and thanks to Simon, Stephanie, Rachel; Andy, Angela; David, Igor, & Tuhin; Katharine, Dave and Ben. Special congratulations to Melanie Unwin, Deputy Curator, House of Commons, for steering New Dawn to a safe home, and our reporting team, Jackie, Deborah and Linda. Boni's film, A Dream for Sizewell, first shown on Anglia TV in 2010, is to be shown again at the Sizewell Summer Show, where artist Maggie Hambling has her studio. The exhibition runs from Saturday 23rd July to Sunday 14th August. A whole host of artists are displaying their work, do go. All my gratitude to our web manager Adrian Wright for his creative energy and professionalism. Podcasting has really come of age in 2016. Story and telling a story crisply and well is what www.bonisonesproductions.com specialises in. Our award winning team would be happy to help you with your regular commissions. Just email us bonisones@gmail.com. We are a tried and tested and successful brand working with global leaders and on public policy issues of concern. Our work is contemporary, sharp, and smart. Broadcast is so much fun, but it is the team that delivers the result. Good luck with your work. We wish you well. Again thanks to Ade, our web manager, who keeps us across the latest web trends, Ade is a very smart guy! 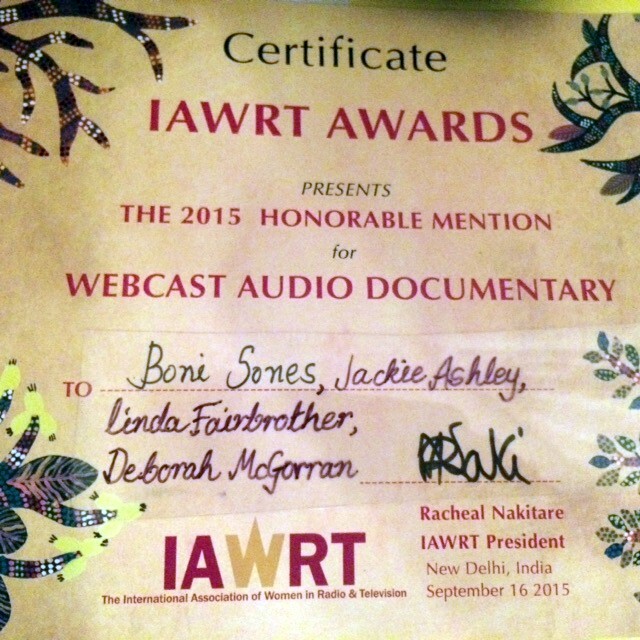 Thanks to the team at IAWRT (International Association of Women in Radio and TV) for posting our award to us from India. Thanks to Ade, our web manager, an invaluable member of our team. CBR Blogs: You can read my Blog and podcast on Women in Politics and Women in Business just posted. CBR media article: Technology and the Future. CSA podcasts at Cambridge Service Week 2015 - Harnessing Technology. CSA podcasts: Animal Health and feeding the World. It seems persistence pays off. After eight years of broadcasting www.parliamentaryradio.com has won an 'Honour' at the International Awards Ceremony for Women in Radio and Television. Our Honour was for our two part documentary web broadcasts in March 2015 on the 10 Labour Women MPs leaving Westminster after 200 years of service. Thanks go to Jackie, Deborah and Linda for doing the interviews with me for the History of Parliament Trust and to Dr Paul Seaward its Director for encouraging us to do it. Thanks to Frieda Werden of Wings Radio in Canada, who nominated us. TV: Kristine Ramm, Norway, Feminists of the 70s, NRK; Adele Tulli, United Kingdom, Rebel Menopause. Radio: Karena Wynn-Moylan, Australia, Memories of Sarajevo: singing a new song, Bay FM, 99.9; Mindy Ran, the Netherlands, Women on the Frontlines 2015, US-based Pacifica Radio Network. Web audio: Boni Sones, Throwing in the Towel: how Labour Women MPs fought to change Westminster Politics,The women's parliamentary radio website. What a busy month. Web podcasts and documentaries in radio and Video on the Chinese economy, the growth of India, and new technology for the CBR, CSA, and WPP. Quite a lot to handle, but it means www.bonisonesproductions.com is up to the minute with what is making the news across the globe in the UK and the BRICS. Really interesting content well put together with the teams I work with. I really enjoy this work and the people I work with. Thanks to them. Thanks to Simon Deakin, Director of the Centre for Business Research, for including me in the work on his newly published paper on the "Internet of Things!" You can read it here. New laws are needed to facilitate the further expansion of the IoT. "I think you've managed an amazing feat to get all these together and compiled in a short time considering the level of people involved!" Good quality broadcast content needs teams! It is good to work as part of a global team of business reporters and get positive feedback on the events: "Always great to work with you. Have a lovely weekend. Regards, Margui", WPP The Store. Looking Glass Documentary is up and running - do listen! My thanks go to Adrian Wright of Treefrog Web Design for his superb design and layout of my Looking Glass documentary on the 2015 General Election in Cambridge. Adrian's team spirit and creativity leads me to better things and this particular work was a marathon to complete. It is dedicated to two Cambridge friends and to the precious democratic processes themselves, and all those who work to ensure the day of the vote and the night of the Count at the Guildhall goes so well. Do read and listen to our audio interviews, which capture a moment in time and history from the transition from paper systems to Twitter and Facebook. My book will be published in the autumn and we will have a launch event then too. Thanks to all those we interviewed particularly my colleagues at the Cambridge Evening News and in the Press Gallery itself and, without doubt the Cambridge City Council staff and all six candidates across party. I had the time of my life producing it! Andy gets a new job! Congratulations to Andy for his new position as Director of the IFM. Well deserved for Andy and his team. They are really good to work with. If you want to see how a web Session broadcast should be managed, watch this. Again it is great to be part of this creative team, if only from the side lines! Creativity at its best is motivating. Well done Tuhin. Thanks to all those new MPs, from all sides of the political divide, the SNP too, for their interviews for www.parliamentaryradio.com on their Maiden Speeches and PMQs. Do listen. Ann Treneman of the Times is a great listen. You will learn so much. I still am! Helen Taylor of the Over Gallery in Cambridgeshire "In Conversation" with Cambridge artist Julia Ball during her recent exhibition there. "Wow, roll on the wet days". Do listen. I thought I would drop you a line, having seen Boni's excellent note about the interviews she has managed to obtain covering the election and the election campaign in Cambridge. As the organisation compiling a history of parliamentary and electoral politics in the United Kingdom from the middle ages to the (near) present day, we've been keen to see Boni's project flourish as it's something we would like to see being done more broadly across the country. We'll be holding on to Boni's recordings to add to our own archive of material on politics and elections, and hope to use it eventually as the fundamental basis of our work. I'm delighted that thanks to those who helped and cooperated they are so full a record of an exciting election, and perhaps may form a basis for other projects that we could get going across the country. Dr Paul Seaward", Director History of Parliament Trust. If you want to contribute to my new audio podcast documentary on how a General Election is organised at the grass roots level then do email me. I have been recording interviews at various Cambridge Hustings meetings, talking to the City Council who organises the voting and candidates lists and turning up to speak to the party workers canvassing on the ground. It is not all about the Leader's Debates; after all it is the foot soldiers and the blitzing of wards that gets the votes out on the day and into the polling booths. These practices may soon be a thing of the past, as online canvassing takes on greater importance, and Cambridge, said to be a three way marginal, is an interesting Constituency to cover. The History of Parliament Trust and Dr Paul Seward, its Director, are supporting this work. Thanks Paul. Thanks to Liz Nice at the EADT for putting my Millicent Fawcett and Elizabeth Garrett Anderson article online. Strange that people don't realise that these two historic campaigning women were from Suffolk, and that they were sisters. Do tweet it and tell your friends. Thanks to the historian Elizabeth Crawford too. Professor Andy Neely, Cambridge Service Alliance, published his new research on Big Data and Business Models in the Telegraph. Do listen to his podcast too on the Alliance website. This work is ahead of the curve. Read today's Guardian for Boni's article on the Ten Labour Women MPs standing down after serving a remarkable 200 years in Westminster. Go to www.parliamentaryradio.com page for our new two part documentary which charts their high and low points in British Politics and their significant achievements for all of us. How can the Postgraduate Diploma in Entrepreneurship help the entrepreneur? Do listen to our workshop podcasts Law and Finance in Rising Powers - this is a hot topic at the moment. Congratulations to David Roth CEO The Store, WPP EMEA and Asia and Tuhin Dasgupta, for their correspondent style videos created specifically for the launch of the BrandZ Top 100 Chinese Brands for 2015. What a privilege to work with this team, script and develop these documentary videos with them. David's presentation stands out and these films have polish. Thanks for the credit too. Story telling is important to me. Do read my Fawcett blog and listen to the new Doc! Happy to let you know your blog and podcast are now live on the website. You can listen to the Cambridge Service Alliance The Future of Services in a Digital Age podcasts here from their October 2014 Conference. It is stimulating to be part of such a global connected forward thinking team and their work. The Centre for Business Research, the University of Cambridge, continues its important work on The Internet of Things. What are the benefits to society of Machine2Machine communication, and how do you protect an individuals privacy and personal data? Watch out for our future report. Two Suffolk women have often been forgotten when the story of women's power struggle for the vote is told. 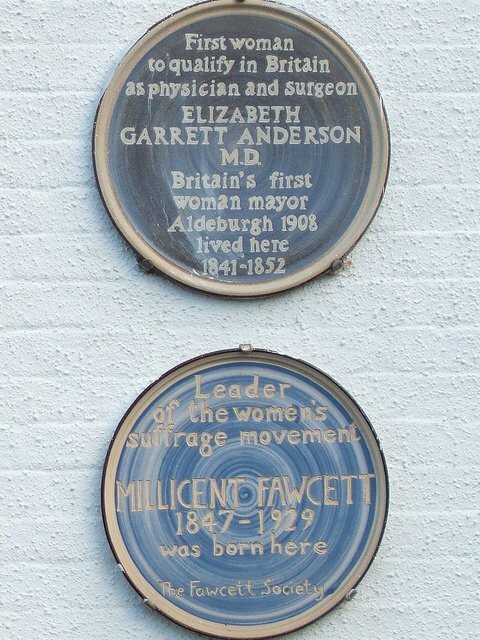 While film and documentary makers have chartered the story of other suffragette leaders they have overlooked the importance of Elizabeth Garrett Anderson and Millicent Fawcett who lived in Aldeburgh and whose uncle owned the Garrett Anderson Steam Engine works in neighbouring Leiston. These two sisters have an inspiring story to tell, and their influence on women's rights in all areas of our lives including education and health care still resonate today. While the blue plaques in London and Aldeburgh commemorate their achievements, the story of how industrialisation stimulated their ambitions and concerns is often neglected. Here Boni Sones, who grew up in Sizewell retells the story of Suffolk's Two Forgotten Sisters and why it still impacts on women's rights in a Globalised World today. Thanks to the Long Shop Museum Leiston, EGA for Women Museum, UNISON, London and historian Elizabeth Crawford. Music copyright belongs to: Leonard Bernstein, Britten four seas, Dawn. Thanks go to them. Congratulations go to David Roth, CEO, The Store WPP, EMEA and Asia, for the launch of his teams' WPP BrandZ Top 50 Most Valuable Indian Brands. It was a pleasure to help script these videos and work alongside such a gifted production team. It was also fun. Do take a look. Together these short videos tell an impressive story of India's economic and social progress. The work of the Centre for Business Research get's a good mention on the Social Europe Journal website. Intelligent public policy analysis needs a platform for debate, and it's good to see issues well explored and explained in full! Not every story can be told in a Tweet. 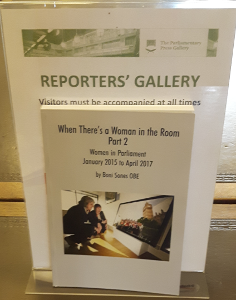 The Boni Sones and Associates Archive opens at the London School of Economics with our 350 audio interviews and documentaries with women MPs across party. Thanks to all who helped over the seven years of broadcasting through the Web, you all get a mention in my new book. Thanks also go to the team at the LSE who made the Archiving a reality. We are proud to be sitting beside their new Women's Library. See our WPRadio Page for more. Many congratulations to David Roth and his team at WPP the Store - WPP EMEA and Asia for their successful launch of the 2014 Brandz Top 100. I enjoyed scripting and helping to produce their Google Film - now the No1 Brand in the World. What a creative buzz to work with people like this. Thanks for including me again! Thanks for sending me a copy of your new book 'When There's a Woman in the Room', and for your kind note. It is, as you know, a subject I am deeply interested in, and I wanted to offer my best wishes for your success with the book, and for all your future endeavours. "Will the Minister join me, and I am sure many hon. Members in this House, in congratulating Boni Sones OBE on her achievements in founding and running Women's Parliamentary Radio? 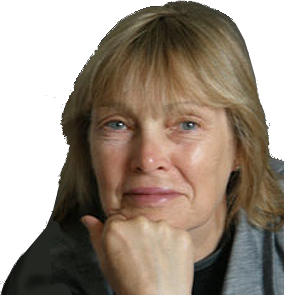 Her work will be archived at the London School of Economics and has led to the book 'When There's a Woman in the Room'. Does the Minister agree that Boni Sones deserves this House's sincere thanks for encouraging women to participate in public life in the UK and overseas?" "I am very happy to endorse and agree with everything that my hon. Friend has said. Boni Sones is a fantastic role model in her own right and has done considerable amounts for the representation of women in Parliament." 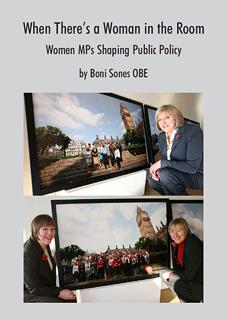 'When There's a Woman in the Room - Women MPs Shaping Public Policy' by Boni Sones is published this week. It has been a really rewarding seven years of broadcasting with www.parliamentaryradio.com and previously www.wpradio.co.uk across party with men and women MPs on issues of concern to women and families. Our 350 audio interviews can now be read about together with an MP "Hot Quote" beside each report in this new book. There are international interviews too with women parliamentarians in Europe, Africa and Asia. I have looked at: Childcare and Parenting; Women's Representation in public life; Equal pay and low pay; Women in the Boardrooms; Violence against women, DV, Stalking, Prostitution, Forced Marriage, FGM; Women in Government and the Shadow Cabinets; The men supporting women; Campaigning women of the past; International issues and parliaments; Campaigning in the Constituency; Speaking in the Chamber and Westminster Hall; Campaigning in Parliamentary Groups; Web links, blogs, and press articles. Do email me for a copy: bonisones@gmail.com. "Boni, things will happen because of your Parliamentary Radio for Women. People will never know how much it has done to influence the debate. You may not be able to quantify that influence but others will be influenced by it." - Lesley Abdela MBE, Shevolution and Britain's gender post conflict specialist. "Boni, your book is such a fascinating read, and one which I will be referring to on a regular basis." - Caroline Adams, Women's PLP. You have been an absolute inspiration to so many of us and should feel very proud of your achievements with www.parliamentaryradio.com! Do keep in touch - I'm sure we will continue to bump into each other. Thank you for this lovely email Boni. It's been an honour to even be involved with wpradio and now www.parliamentaryradio.com for the last seven years. "Boni I just wanted to text to say thank you very much for the poem book. The poems are brilliant. Thank you so much for including us, we will treasure them and hopefully read them to our kids. Thanks to the UK Innovation Research Centre for its five years of Summits and Conferences. Listen to their podcasts here. and to Professor Alan Hughes the Director of the Centre. "Dear Boni, Thanks for your kind email. The series of podcasts you have produced have been extremely valuable to us and will be an important part of our archived outputs. Growing biotech business with the CfEL - a successful October 2013 conference for all! What does it take to be a bioentrepreneur? Do listen to these incredibly informative podcasts with leading women in the industry. As a line-up it really stands out. Thanks to the CfEL for asking me to work with them on this. The Cambridge Service Alliance gets so far ahead! Why service innovation and ecosystems matter - do listen to these important research reports from the Cambridge Service Alliance and to their audio podcasts of their recent conferences. It is so far ahead of the others. Preserving a history for future generations! It was good to collaborate with Sibson Images on this new Cambridge Assessment video - it really does "inform, educate and entertain"! Thanks Jen for thinking up the concept for us to record. Congrats to Vicky for the publication of Prisonomics - and thanks for the thanks! The CBR Blog has some vintage podcasts and blogs - it's good to see theory now becoming accepted wisdoms in public policy making. Do read and listen to the podcast series on The History of Retail in 100 Objects - it was fun to script the 100 audio podcasts for David! What a super achievement for all his team and associates. It's amazing to see the impossible becoming possible! Boni is now a Wiki Editor. Just picked up your book - many thanks for sending it, and congratulations on completing it and getting it out. It's a good read and a great stimulus to us - our own oral history project is now under way and will eventually be a complement to yours. Congratulations to the new Centre for Business Research Blog Website. Look out for the launch of WPP The Store's "History of Retail in 100 Objects" - it was fun to script. "Boni, You turned something quite research-intensive into something really tangible and interesting. I think it worked brilliantly as a programme and will publish it in that format as soon as I can. I was sent the edited podcast a few weeks ago for review. I just wanted to let you know that I think you did a very good job. It was a pleasure working with you. 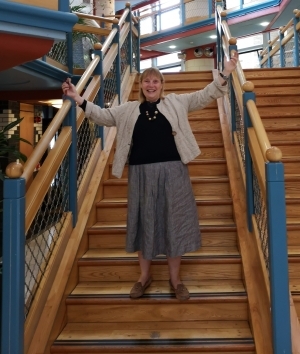 I'm not sure what it was but you managed to put me immediately at ease and, from my perspective, brought out the best in my research and passion for the subject through your questioning for the Cambridge Assessment podcast series. I think that is the hallmark of an exceptional interviewer. Thank you so much. Thanks to Vicky Pryce for her acknowledgement in her new book 'Greekonomics'... it was great to be part of the editorial team! 'The Boni Sones political Archive' can now be found at the London School of Economics. - Ellie Robinson, Archivist, has said it is of "extreme significance"
"CfEL podcasts have been found to be very popular on University SMS and iTunesU - over 550,000 hits since 2008. This makes them by far the most popular collection offered via CJBS. So congrats on being part of their success..."
Katharine Price, Marketing & Communications Manager, Centre for Entrepreneurial Learning, Cambridge University. "There was a lot of interest in and praise for the FT blogs and the Governance publicity document at the CBR Advisory Board earlier this week, thanks." "Dear Boni, from what I read, I think you have done a grand job of our new report fom a hodge podge, mish mash or what ever you like to call it. Thank you." Diane Cook, the CLAHRC Cambs and Peterborough. Theresa May and Ed Miliband have both given interviews to Women's Parliamentary Radio this month. Economic conferences are in full swing in Cambridge, fascinating to cover. Writing at my desk in Cambridge now, more creative stories of Suffolk. © Copyright Boni Sones OBE | Read Boni's Blog | Website proudly designed by Treefrog Web Design.